We have various facilities in order to support research activities. 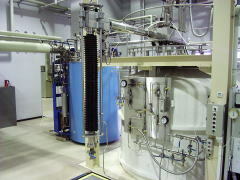 Cryogenic Service Laboratory for supplying liquid helium and liquid nitrogen, Machine Shop for various machining, Radiation Safety Laboratory for the safety in experiments that utilize X-ray, γ-ray and radioactive materials, Library, Stock Room, International Liaison Office for supporting foreign researchers, Information Technology Office for handling and supporting network related matters, and Public Relations Office. In each facility, several staff members are working under supervision of the corresponding committee.